A nutritious, flavor-packed spinach lentil soup that comes together in minutes! With earthy Mediterranean spices, lime juice and fresh parsley! Vegan. In a large ceramic or cast iron pot, heat 2 tbsp olive oil. Add the chopped onions and sautee until golden brown. Add the garlic, all the spices, dried mint, sugar and flour. Cook for about 2 minutes on medium heat stirring regularly. Once the lentils are fully cooked, stir in the lime juice and chopped parsley. Remove from the heat and let sit covered for 5 minutes or so. Serve hot with pita bread or your favorite rustic Italian bread. 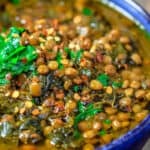 This recipe uses small brown lentils, if you choose larger lentils, your cooking time may be longer. If you like, you can soak the lentils in cold water for 20 minutes before cooking to speed things up. Recommended for this Recipe: Private Reserve Greek extra virgin olive oil (from organically grown and processed Koroneiki olives). And from our all-natural and our organic spice selection: ground coriander; ground cumin; and sumac . SAVE! Try our Ultimate Mediterranean Spice Bundle, or created your own 6-pack or 3-pack from our all-natural or organic spices! And check out the Greek Olive Oil Bundle!